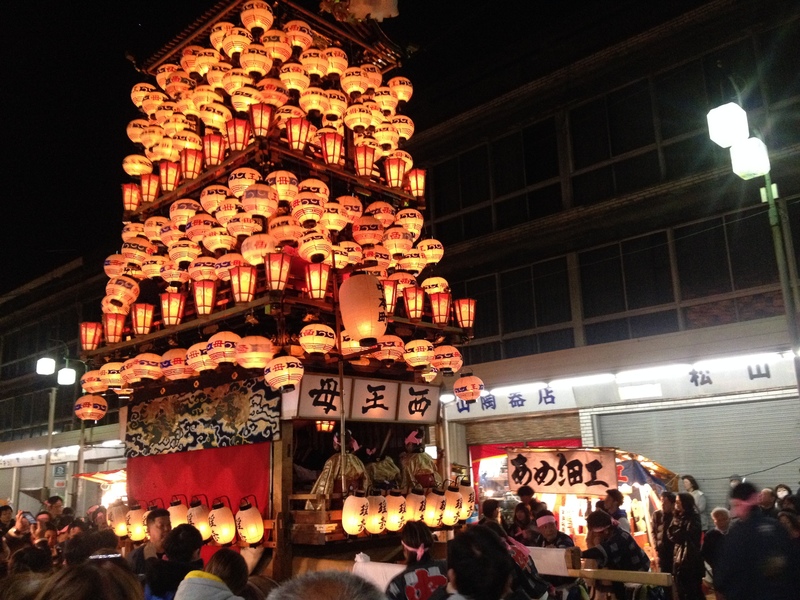 On the first weekend of April every year, Inuyama-shi (or Dog Mountain City) holds its Spring festival. 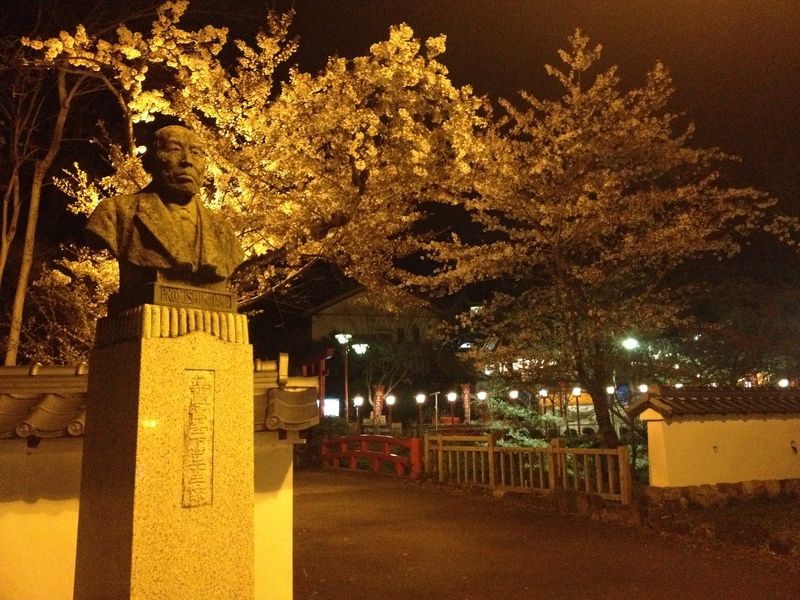 Inuyama is about a half-hour train ride north of Nagoya, and, working on the weekends as we do, we only managed to arrive after sundown. As such we missed the day-time festivities, but were there just in time for the main event – the procession of thirteen three-storey floats around the city under cover of dark. Each float is uniquely, ornately decorated with paintings, calligraphy, wooden ornaments, and hundreds of paper lanterns. Each is pushed by a collection of volunteers along its own winding route through Inuyama. And each float houses a group of schoolchildren rhythmically hitting drums, chanting, and playing the kind of reedy, tremulous flute you hear and instantly associate with the ancient, proud, traditional Japan that likely only ever existed in the show of these festivals and the fancy of westerners. After a time, the slow-moving floats separated from one another and turned from the main road into the narrow backstreets. With this the huge crowds also dispersed. Some people left entirely, while others chose a single float and followed it as it moved away from the rest. For whatever reason, very few people chose our float, and as it made its way further away from the streetlamps and crowds and bright shop-faces the glow of the paper lanterns grew richer, illuminating both the float and its small retinue of tourists and photographers with an ghostly, sometimes ethereal light. The float was elegantly constructed, but like the rest it was a heavy, lumbering thing, and maneuvering it through the streets became incredibly difficult. Sometimes electrical wires hemmed in its roof, and sometimes the roads narrowed, becoming barely wide enough to pass through. When these obstacles came up the men pushing the float took a break, consulted, took a drink, resumed their places, and lifted and pushed and shouted until it moved, often in the right direction. When twisting it around corners the paper lanterns jerked and listed about violently. When shifting it over a bump in the road the whole mass of it reared back and looked about ready to capsize. Whenever any of these things happened we became uncomfortably aware of just how many naked flames were lighting it up from the inside. But there were no disasters, and eventually, after several hours of moving we came full circle. The men pushing the float stopped for good, sitting, squatting, lying on the ground, recovering from exhaustion and barely-disguised drunkenness. And the float itself was quickly picked apart – the flames were snuffed out, the lanterns removed. The children kept singing and playing for a while, but soon they stopped, and one by one were hoisted out of the float and onto their feet. As this was happening we saw another float turning a corner and we went to follow it for a while, trying to stretch out the weird magic of the evening even further. At one point we were forced to stop and wait as another float – crafted with the hull and figurehead of a ship – passed us in the opposite direction, straining and shifting as it went. Eventually we saw Inuyama Castle appear above the rows of houses, and we made for it. By this point almost all the floats were returning to be stripped and put into storage. But before we left to take the train home we decided to walk around the edge of the castle for a little while, to see the shrine, and to get something to eat. It’s here where everything gets a little less dreamy – where the lanterns pale out and weaken in the face of streetlamps and shop-faces. Where the music is less thin and tremulous, and the image of the proud, traditional Japan collides with the reality, and everything you’ve been silently letting yourself pretend for the moment gets mixed up and anachronistic. We passed stalls selling fried chicken and okonomiyaki. Gas-powered generators whirring loudly, and the tinny sound of a stereo playing a song from the movie Frozen. We met a Turkish man who sold us some very good ice cream. And if that sounds negative, it’s not. 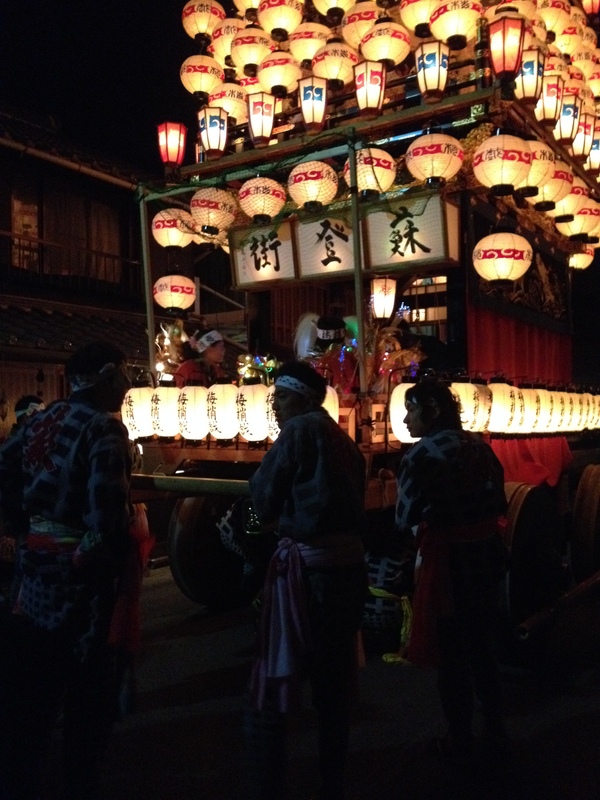 That magical feeling we got from quietly following the float through the dim streets of Inuyama – a feeling that’s hard to pin down and almost impossible to explain – wasn’t real. Well, it was and it wasn’t. It wasn’t real in that it was a fascination and a longing for something that doesn’t exist. And it was real in that we knew that, but allowed ourselves to feel it anyway. 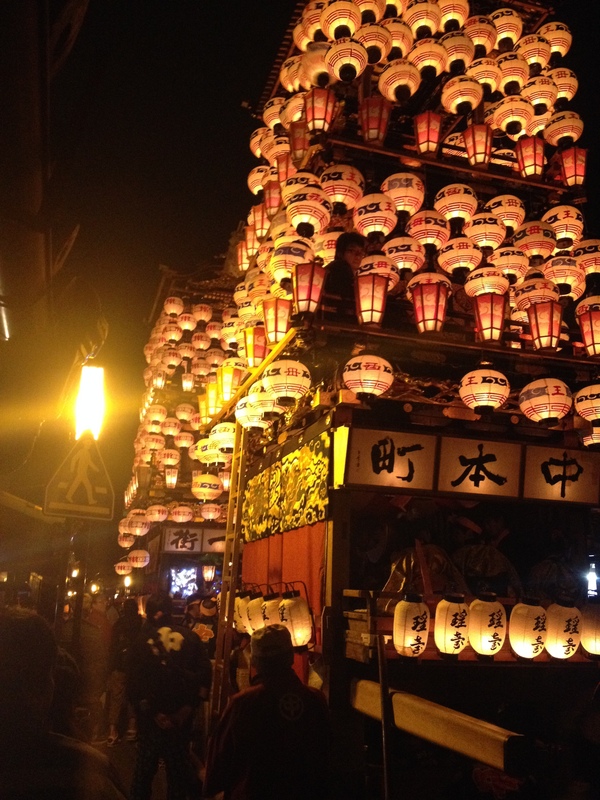 Those floats, and those lanterns, and that music aren’t Japan; not really. 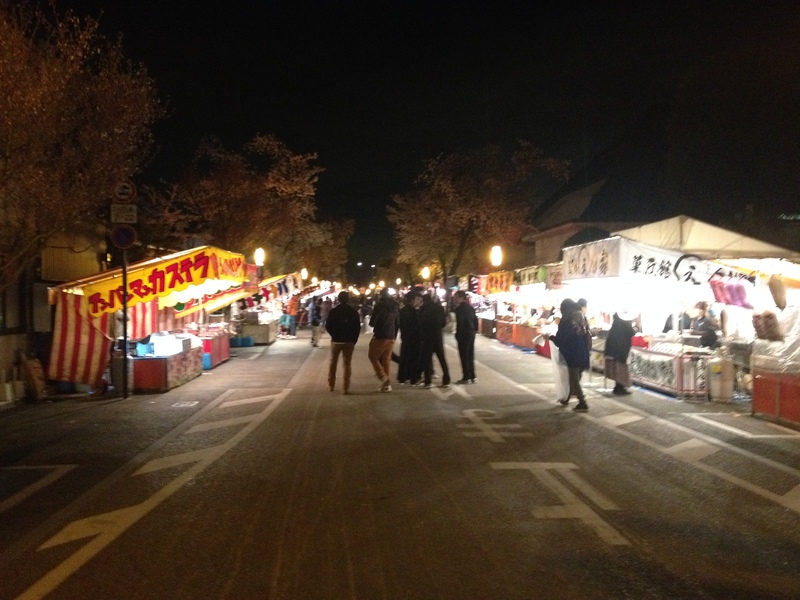 Inuyama Festival isn’t Japan. 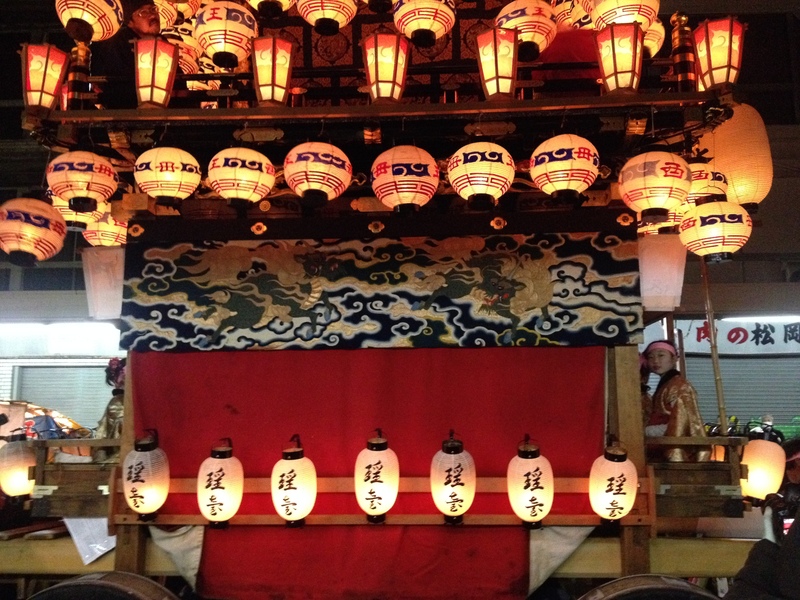 Japan is a violent clash of countless things – those floats and those lanterns and that music included – but it’s not, and probably never was, what we – what I – liked to briefly pretend it was when we were following that float. Like any country Japan is a fascinating, byzantine amalgamation of its past and its present, as well as all the exterior influences that it’s faced. And in 1635 when the Inuyama Festival first began the situation was probably very much the same (admittedly, with Sakoku beginning around that time the exterior influences might not have been quite so important). Things like the Inuyama Festival, or tea ceremonies, or kabuki plays are elements of Japan, sure. Even important elements in a way that Morris dancing and cheese rolling and maypole dancing perhaps aren’t for England. But as a westerner – one who very much still falls on the gaijin rather than the gaikokujin end of the spectrum, if I’m being honest with myself and with you – it’s very easy to romanticise these archetypal and act like they’re something approaching the whole. Even though, obviously, I know they’re not. In other words: Inuyama Festival, besides being a spectacular experience, served to remind me that any experience I have of Japan, no matter how informative or explanatory it might seem, is filtered through my own thoughts, and the impact of my own culture. The movies I watched as a kid. The Orientalism of varying degrees and subtleties that shape our way of thinking in the UK, and elsewhere, often without our consciously realising it. In other words: I don’t want to be the person who comes back from travelling, or living, abroad and says “Aren’t they so very curious, out there?”. Or the thousand more subtle forms of that thought that it’s so easy to allow yourself to land on. I don’t want to expose myself to temples and castles and kabuki plays and think that makes me understand Japan. I want to work very hard, and as honestly as possible, to understand something of this country, its history, and its culture. But I think I need to accept that that might never happen, and that it might be naive and simplistic to talk of it like that at all. In other words: I think it’s incredibly hard – much, much harder than most people will allow – to bridge the gap between your own understanding and something alien to you. The gap between you and a foreign culture, one embedded in a historical and social context that only ever overlapped with your culture’s own at the very margins – that might be the hardest gap to bridge. A year or two living here. A couple of Japanese conversation classes a week. 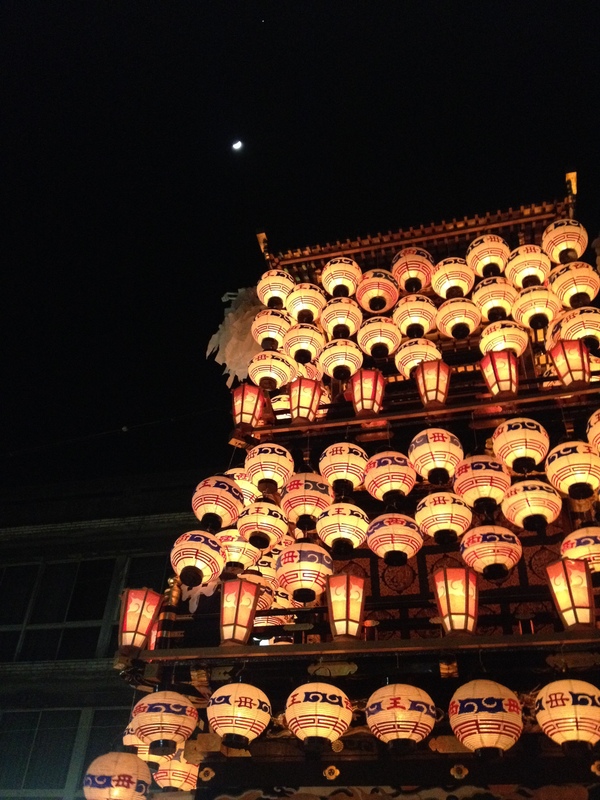 A trip to a spring festival, or to Kyoto, or to Tokyo. That certainly won’t be enough. But we can try, I suppose. As long as we try very hard not to simplify, not to let our eyes glaze over, our minds wander too much, maybe we’ll make some progress. Maybe we’ll reach something small and slight and not so very far away. But maybe not. Who knows. As long as we’re willing to accept that it might never happen, there’s no harm in trying.